WAS $48. The epic story of an ancient, elusive herb with legendary curative powers that have enticed and mystified us for centuries. 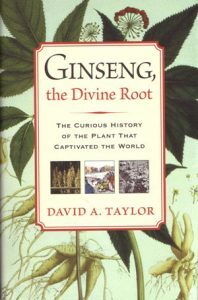 Prized for centuries by Chinese emperors, Native American healers, and black market smugglers, Ginseng launched the rise to power of China’s last great and influential dynasty; inspired battles between France and England; precipitated America’s first trade with China; fostered the study of comparative anthropology; was collected and traded by Daniel Boone; and has made and broken the fortunes of many. Today its healing properties are being studied for the treatment of diabetes, cancer, and Parkinson’s disease. David Taylor takes readers from forests east of the Mississippi to the bustling streets of Hong Kong and deep into remote corners of China as he weaves together the history, culture, and intrigue surrounding the “Root of life”.